Coverage: Scrum V Live on BBC Two Wales, online and the BBC Sport app, live on BBC Radio Wales, live scores on the BBC Sport website. 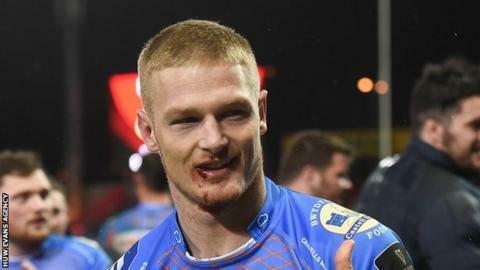 Scarlets wing Johnny McNicholl has no regrets over missing out on the chance to play against the 2017 British and Irish Lions in New Zealand. The 26-year-old left Crusaders to join the west Wales region during the autumn of 2016. His former Super Rugby team host Warren Gatland's tourists on Saturday, 10 June in the Lions' third warm-up contest. "It's not a regret because I knew the Crusaders were playing the Lions before I signed," said McNicholl. He continued: "It was a bigger carrot here to come and play for the Scarlets. "So it [playing against the Lions] wasn't really in my decision-making at the time." The Christchurch-born player says the Lions will face stern games outside the three Tests, the first of which takes place two weeks after they face Crusaders. "There's plenty of excitement in New Zealand for the series. Even the Crusaders, Hurricanes and New Zealand Barbarians - they won't be easy games. The boys will be up for those games." McNicholl has established himself at full-back at Parc y Scarlets, having come to prominence on the wing for Crusaders. But the New Zealander admits to "quietly" coveting a return to midfield, where he played during the early part of his career. His switch to full-back began after joining provincial team Canterbury and the presence of All Blacks full-back Israel Dagg prompted a move to wing when he reached Crusaders. "I actually played centre my whole life until I made the Canterbury team and they shifted me to full-back," said McNicholl. "So then I was a centre/full-back. And then I moved to the Crusaders and Israel Dagg was full-back there so I moved to the wing. "I'd never actually been a winger, but then I actually ended up playing wing for five years. "Most people probably say I'm a winger, but I still class myself as a midfielder, quietly."